No, this is not a post about a war between the three rival nations Centripetal, Centrifugal, and Coriolis. It’s about physics. Because, you know, we all love physics – or we should. Physics makes the world go round, literally, and in this case makes stuff go sideways. A centripetal force is not an army, but a physical force that makes a body follow a curved path. If no forces apply to a given moving body, it will simply continue to move in a straight line. 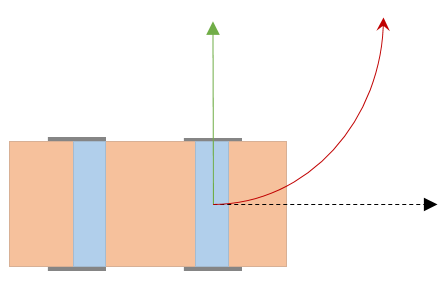 A force applied to a moving object from an angle will pull it into a curved movement. A good example of this, is when you steer your car around a corner. By turning the wheel, you turn the tires, which causes friction between the road and the tires, causing a force pointed toward the inside of the turn, which angles the car around the corner. This is shown in the diagram below. In dotted black is the car’s initial trajectory. In green is the centripetal force, and in red the actual course of the car. When you are inside the car when it turns, you feel like you are moving to the outside of the turn. This effect is sometimes called the centrifugal force. In the diagram above, that arrow would be pointing down (or to the right side of the car, if you prefer). However, this force is not real. The centrifugal force does not exist. What you are feeling is your forward motion being impeded by the centripetal force. Your body ‘wants’ to move forward, but the seat of the car and the seat belts pulls you to the side. The coriolis force is also a fictitious force. Like the centrifugal force, it is not a real force. Imagine you were a very tiny person standing on a spinning record (yes, those black things from the seventies). Now imagine a very tiny plane flying past. To you, it appears that the plane is moving in a curved path, while it is in fact moving in a straight line. One of the more interesting possible applications of centripetal force, is to simulate gravity on space stations. We call this spin gravity. A rotating-wheel-station is a space station consisting of a large wheel rotating around a central shaft. If you rotate the wheel at a certain speed, the resulting centripetal force will be 1g. This means that if you where standing on the inside of the wheel rim, you would feel as if you were being pushed down at 1g. In other words, you’d feel as you were in standard earth gravity. The (fictitious) centrifugal force is acting like gravity. This type of station could provide fake gravity in space, which would be very important in space travel. Zero-gravity – or more accurately for earth orbit: perpetual free fall – is pretty cool and looks good on pictures, but it has some negative effects on the human body. The first 72 hours you can get space sickness, which bears similarities to a bad case of car sickness. After that, your body has adapted to the initial effects of no force pulling your body down, but after a while the long term problems begin. Muscle atrophy, skeletal deterioration, effects to the blood flow and immune system, and to top it off, your eyes start to deteriorate. Mars is the next frontier of human exploration, but trying to do it in zero-g could lead to a team of half-blind astronauts arriving at the red planet in wheelchairs. Try to build a biodome like that. So, artificial gravity would be nice. However, spin-gravity has its own downsides. As noted above, the coriolis force is a result of being in a rotating environment – like being a tiny person standing on a record. Or, like being on a rotating-wheel space station. Yes, in spin gravity you would start to notice coriolis force effects. If you were to throw a ball around in your spinning space station, you’d notice it curving away to the side. More interestingly, the gravity you feel on your head is actually smaller than the gravity you feel on your feet. The cause is that your feet spin slightly faster because they are further from the spinning station’s center. The bigger the station, the less this effect is, though. Bottom line, we don’t know what kind of effects this kind of fake gravity has on a human body in the long term. A trip to Mars could be hazardous to your health, not just because of radiation, meteors, and the inhospitable planet itself, but also because of weightlessness during the trip. Spin gravity could reduce the problems, but we have no actual experience with this. Centripetal, centrifugal, and coriolis forces. Interesting things to have a handle on.